The Island of Moszark was orignally One Whole, created my the gods of the Kon Kluck Tribe, They Pulled this Island out of the sea, and then an Evil Warrior Scattered the Islands Into 5 Peice. As millions of years past, the islands shifted and created life. Find, explore, and survive on this rock with life. There is one huge and one small mountains, with lakes and scattered islands that surrounded it. Big huge Trees, with ores. Please Comment of What you think and what I should make next! That is certainly one huge island. Though no passive mobs seem to be spawning. 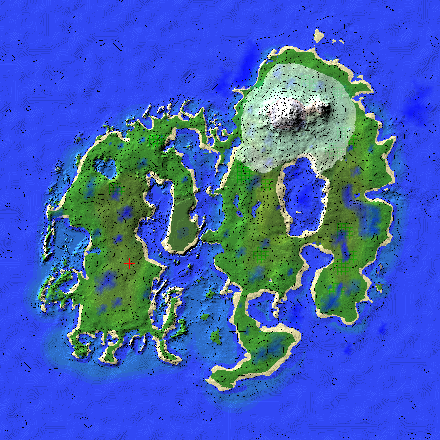 Maybe you could make more custom terrained worlds for survival? Create the world/s in survival with no cheats, it'd be interesting to play in such terrain. (You can open to LAN & turn on cheats while making the world). Ok sir, I can make the world again without cheats if you would like. And also I will try to put passive mobs into it. P.S Thank you for commenting on problems with the world.